Karnidale, the great Western Australian circus festival! Holy crap. You can see the point of impact where the lock got bashed in. Amazing that it just caved in like that. On a more positive note, that gig looks fun! Yeah, it was an extremely fun gig! As to the damage, *cough* Jetstar *cough*, i'm trying to get a new case from them, this ones pretty much had it, both locks are bashed in, the plastic split...not worrying about the guitar, battle scars etc. Plus i imagine it would be a complete respray..and (mercifully) it actually is ok playing wise. Can't imagine the impact to create this sort of damage though, like a compression of that top bit enough to crack the paint off from inside a padded SKB case.. who knows. 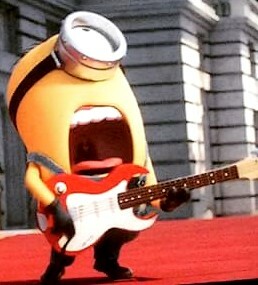 Anyway, the guitar still plays so onward and shredward..
You so much more relaxed than I would be if that happened to me! dude, sorry to hear about this. I would be so bummed if it happened to one of mine. If you can get them to buy you a new case, maybe go for the Hiscox Pro II. I have one of these and it is super strong. Looks like they cost around $300 new. Well, the good news is that they've agreed to replace the case! And here's one last pic. that does look like fun! bummer about the guitar damage.